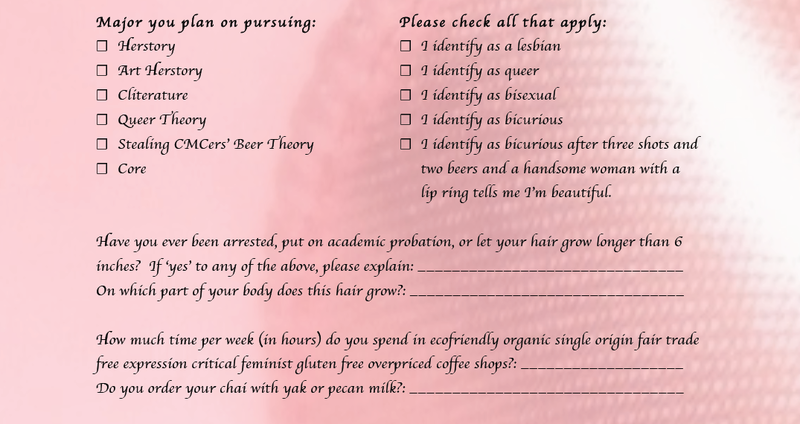 Not to be left behind, the Scripps College Admissions Office has leaked their application for the class of 2018 to us! You know Core isn’t a major right? Yes, because Herstory, Art Herstory, and Cliterature are majors. Thanks for pointing this out. I’d also like to clarify that Stealing CMCers’ Beer Theory is only available as a minor. Why do the 5Cs keep insisting are writing these embarrassing articles reinforcing stereotypes of our colleges? I guess we just love breeding animosity. I think you misspelled hilarious. Why do we have people who don’t appreciate the value of fun satire at our colleges?!? Are you a CMS football player??? I’d like to point out that a CMS football player would most definitely appreciate the value of fun satire at the 5Cs. This is excellent. And it’s true… You never, ever escape Foucault. Words from my CORE profs in class today.